The homage to a classic Detective cover convinced me to pick up Birds Of Prey #98 (written by Gail Simone, pencilled by James Raiz, inked by Robin Riggs). For “Part 3” of a story, it feels a lot like a Part 1, and that’s good for us returning readers. Some ice-queen assassin gets out of jail and proves her badassery pretty quickly; meanwhile, Black Canary, Oracle, and Huntress (a trio that always seems TV-mandated to me) have to deal with two new characters — a precocious little girl and a [SPOILER!] superpowered teenager with a Batgirl fixation. I rather liked it, except for a couple of technical details. First, early in the first Babs/Dinah/Helena scene, an unattributed narrative caption made me a) hunt for the speaker, assuming she were in the scene; and b) wonder whether a good old-fashioned thought balloon might not have been clearer. Indeed, if anyone could rock the humble thought balloon back into fashion, I’m sure Ms. Simone would be at the top of the list. The other thing happens towards the end of the BC/Batgirl fight, when someone wearing a yellow glove punches someone else about fifty feet. Context indicates it’s probably BC punching Batgirl, which doesn’t make much sense by itself; but Batgirl’s got the powers and the yellow gloves. Anyway, I’m coming back next month. To me, the big reveal about the Emerald Eye in 52 #20 (written by the Four Tops, breakdowns by Keith Giffen, pencils by Chris Batista, inks by Ruy Jose) came off a bit bluntly. It’s basically a sight gag, so repeating it just feels like Jay Leno milking a punchline. As for the Supernova and Steel scenes, honestly I had to keep reminding myself they were even in the issue. With no omniscient narrator — and, in fact, no narration at all except Montoya’s internal monologue, which I think has also faded away — it’s hard to connect the three disparate story threads. However, I don’t think that’s the point. If there were an omniscient narrator, I think it would sound something like the bratty kid my sister and I babysat one night with Back to the Future. He and I had seen the movie, but my sister hadn’t, so the first 20 minutes was filled with him exclaiming “Okay, remember that tree! Remember that truck! Remember the clock!” By contrast, 52 clearly wants to be more subtle, so at the very least we are subliminally reminded of Supernova in the Batcave and Steel getting slowly back into the superhero game. I was well into Superman #656 (written by Kurt Busiek, pencilled by Carlos Pacheco, inked by Jesus Merino) when I started to sympathize with the super-beast trying to beat the tar out of our hero. Sure, he was an unstoppable violence factory, but it wasn’t his fault. Therefore, I suppose it would be an inversion of my expectations for Subjekt-17 to turn out irredeemable, after all, and not some familiar type of “there is honor in you, Kryptonian” space-gladiator. Superman’s cognitive dissonance at having to take such a hard line with S-17 was also appropriate. Still, Superman speaks how many languages now; and can modulate his whistles to specific frequencies…? Oookay. Regardless, the story itself was fine, even if more of the fun parts were in flashback (giant trilobite! “Super-Boy!”) Art was gorgeous, as usual. If The Flash: The Fastest Man Alive (#4 written by Danny Bilson and Paul DeMeo, pencilled by Ken Lashley, inked by Walden Wong) is improving, it’s gotten up to “adequate.” Last issue’s fill-in art was open and expressive, but now that we’re back to Ken Lashley’s overly busy pencils, the book feels cramped again. I did appreciate keeping the Rise And Fall Of “The Griffin” to pretty much this issue, even if his rise seemed a bit too quick and easy. The explanation of Bart’s relationship with the Speed Force wasn’t unexpected, and it feels almost like the setup that made sure Kyle Rayner was the only one who could channel Oan power. Overall, the book seems to be setting up a certain status quo for Bart to be the Flash. If that’s the case, I won’t stay with this title for much longer, because so far nobody’s convinced me that Bart’s adventures are worth my $2.99 every month. However, if the “secret of the Speed Force” ends up empowering additional speedsters, or even bringing some back, I’d be more interested in that. I’m still not sure the “don’t get used to the first Flash you see” thing has played itself out yet. 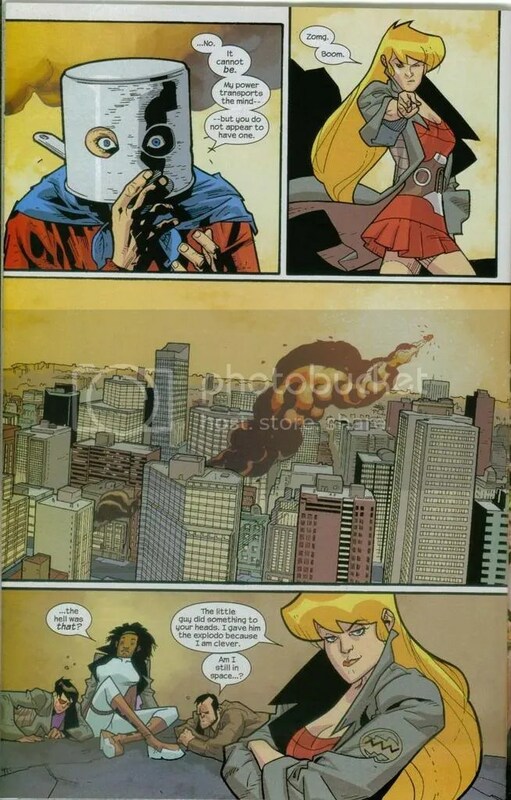 Finally, yes, Nextwave (#8 written by Warren Ellis, drawn by Stuart Immonen) is love. Who wouldn’t want to see Mindless Ones doing West Side Story routines? The satire, if that’s how it was intended, maybe got a little thick once the Mindless Ones started shopping, dining, and watching “American Idol,” but judging from the last page’s captions, I think Ellis and Immonen know to keep the overt intellectualism in the background. Also, I started to feel a little sorry for Rorkannu once the Captain shoved his head in the toilet, but that’s probably just me comparing him to Phil, The Prince Of Insufficient Light.